Today, the vast majority of our meat comes from enormous “Concentrated Animal Feeding Operations” (CAFOs), which often raise thousands of animals in a single structure. This method of raising animals saves companies money but creates many other costs in the form of environmental, health, and animal welfare issues. Despite being industrial-scale operations that produce as much waste as a small city, CAFOs are rarely forced to truly account for and fix the harms that they cause to people, air, and water. Last year, we wrote about a bill that would stop people from being able to bring lawsuits against CAFOs that pollute drinking water with animal waste. Now, there are two more bills aimed at rolling back the progress made in regulating CAFOs. S. 2421 is called the “Fair Agricultural Reporting Method Act,” but it actually gives CAFOs a free pass to poison the air by allowing them to keep their toxic pollution a secret. The massive amount of animal waste created and stored at CAFOs means that high quantities of hazardous substances such as ammonia and hydrogen sulfide are released into the air. The high quantities of these substances in the air not only make living near a CAFO unpleasant — they can cause serious health impacts, even death. In 2017, Waterkeeper Alliance and partners won a lawsuit that forced the U.S. Environmental Protection Agency (EPA) to close an illegal regulatory loophole that allowed CAFOs to not report their hazardous air emissions, even when they are high enough to cause human health impacts. S. 2421 would bring this loophole back and, even worse, expand it and make it federal law. Communities near CAFOs — which are often low income and minority communities — would be back in the dangerous position of not knowing about the toxic pollution being released into the air near their homes and in their communities. At the same time, some members of Congress are trying to stop states from ensuring the responsible and safe production of animal and agricultural products within their borders, by prohibiting state-specific environmental standards, labor rights, animal welfare, and community safety laws. A number of states have passed measures to stop the sale of irresponsibly or inhumanely-produced animal products within their borders, such as Massachusetts banning the sale of eggs produced by hens kept in cramped battery cages. Representative Steve King (R-Iowa) has introduced bills (H.R. 4879/H.R. 3599) that would ban states from making these kinds of rules when they apply to products originating in other states — rendering the measures meaningless. 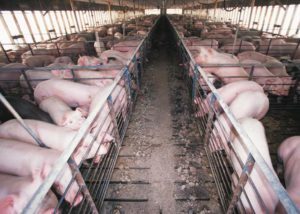 The main intent behind Representative King’s legislation is to save the companies that run CAFOs money — without it, they need to invest in responsible production practices in order to do business in some states. Another bill, introduced by Representative Jim Sensenbrenner (R-Wisconsin), H.R. 2887, would have a similar effect, but would further restrict the ability of states to regulate the quality of products and services sold in their borders.